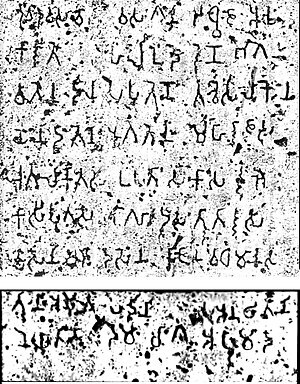 Brahmi script an Ashoka Pillar (circa 250 BCE). Left pillar No. 9 of the Great Chatya at Karla Caves. This pillar was donated by a Yavana (Indo-Greek), circa 120 CE, like five other pillars. The inscription of this pillar reads: "dhenukākaṭa yavanasa / yasavadhanānaṃ / thabo danaṃ" i.e. "(This) pillar (is) the gift of the Yavana Yasavadhana from Denukakata". Below: detail of the word "Ya-va-na-sa" (𑀬𑀯𑀦𑀲, adjectival form of "Yavana", Brahmi script). James Prinsep, known for deciphering Brahmi in the early 19th century, was first to propose a connection between Indian scripts and Greek. He suggested that the oldest Greek was a "topsy-turvy" version of an ancient Indian language. K. Ottfried Muller reversed this proposal suggesting that Brahmi was derived from Greek after the arrival of Alexander the Great. Coin of Agathocles with Hindu deities, in Greek and Brahmi. Obv Balarama-Samkarshana with Greek legend: ΒΑΣΙΛΕΩΣ ΑΓΑΘΟΚΛΕΟΥΣ. Rev Vasudeva-Krishna with Brahmi legend:𑀭𑀸𑀚𑀦𑁂 𑀅𑀕𑀣𑀼𑀓𑁆𑀮𑀬𑁂𑀲 Rājane Agathukleyesa "King Agathocles". Circa 180 BCE. The word Lipī (𑀮𑀺𑀧𑀻) used by Ashoka to describe his "Edicts". Brahmi script (Li=ီLa+်i; pī=ဧPa+ျii). The word would be of Old Persian origin ("Dipi"). Connections between Phoenician (4th column) and Brahmi (5th column). Note that 6th-to-4th-century BCE Aramaic (not shown) is in many cases intermediate in form between the two. "Support for this idea of pre-Ashokan development has been given very recently by the discovery of sherds at Anuradhapura in Sri Lanka, inscribed with small numbers of characters which seem to be Brāhmī. These sherds have been dated, by both Carbon 14 and Thermo-luminescence dating, to pre-Ashokan times, perhaps as much as much as two centuries before Ashoka." The Prakrit word "Dha-ṃ-ma" (Dharma) in the Brahmi script, as inscribed by Ashoka in his Edicts. Topra Kalan pillar, now in New Delhi (circa 3rd-century BCE). Norwegian scholar Christian Lassen used the bilingual Greek-Brahmi coinage of Indo-Greek kings Agathocles and Pantaleon to correctly achieve in 1836 the first decipherement the Brahmi script, which was later completed by James Prinsep. Consonants of the Brahmi script, and evolution down to modern Devanagari, according to James Prinsep, as published in the Journal of the Asiatic Society of Bengal, in March 1838. All the letters are correctly deciphered, except for two missing on the right: 𑀰(ś) and 𑀱(ṣ). Vowels and compounds here. 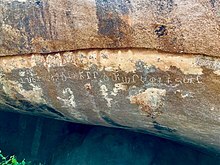 A 1st century BCE/CE inscription from Sanchi: "Vedisakehi daṃtakārehi rupakaṃmaṃ kataṃ" (𑀯𑁂𑀤𑀺𑀲𑀓𑁂𑀨𑀺 𑀤𑀁𑀢𑀓𑀸𑀭𑁂𑀨𑀺 𑀭𑀼𑀧𑀓𑀁𑀫𑀁 𑀓𑀢𑀁, "Ivory workers from Vidisha have done the carving"). 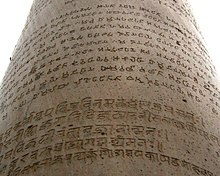 1800 years separate these two inscriptions: Brahmi script of the 3rd century BCE (Edict of Ashoka), and its derivative, 16th century CE Devanagari script (1524 CE), on the Delhi-Topra pillar. The Rummindei pillar edict in Lumbini. in the fourteenth year of his reign. —  Adapted from transliterations by E. J. Rapson, Sukthankar, Richard Salomon, and Shane Wallace. Heliodorus pillar rubbing (inverted colors). The text is in the Brahmi script of the Sunga period. For a recent photograph. ^ Aramaic is written from right to left, as are several early examples of Brahmi. [page needed] For example, Brahmi and Aramaic g ( and ) and Brahmi and Aramaic t ( and ) are nearly identical, as are several other pairs. Bühler also perceived a pattern of derivation in which certain characters were turned upside down, as with pe and pa, which he attributed to a stylistic preference against top-heavy characters. ^ Bühler notes that other authors derive (cha) from qoph. "M.L." indicates that the letter was used as a mater lectionis in some phase of Phoenician or Aramaic. The matres lectionis functioned as occasional vowel markers to indicate medial and final vowels in the otherwise consonant-only script. Aleph and particularly ʿayin only developed this function in later phases of Phoenician and related scripts, though also sometimes functioned to mark an initial prosthetic (or prothetic) vowel from a very early period. For example, according to Hultzsch, the first line of the First Edict at Shahbazgarhi (or at Mansehra) reads: "(Ayam) Dhrama-dipi Devanapriyasa Raño likhapitu" ("This Dharma-Edicts was written by King Devanampriya" Inscriptions of Asoka. New Edition by E. Hultzsch (in Sanskrit). 1925. p. 51. 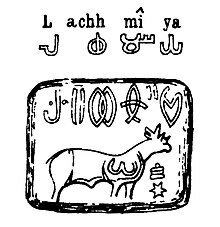 This appears in the reading of Hultzsch's original rubbing of the Kharoshthi inscription of the first line of the First Edict at Shahbazgarhi (here attached, which reads "Di" rather than "Li" ). ^ More numerous inscribed Sanskrit records in Brahmi have been found near Mathura and elsewhere, but these are from the 1st century CE onwards. ^ The archeological sites near the northern Indian city of Mathura has been one of the largest source of such ancient inscriptions. Andhau (Gujarat) and Nasik (Maharashtra) are other important sources of Brahmi inscriptions from the 1st-century CE. ^ Salomon 1998, pp. 11-13. ^ a b Coningham, R. a. E.; Allchin, F. R.; Batt, C. M.; Lucy, D. (1996). "Passage to India? 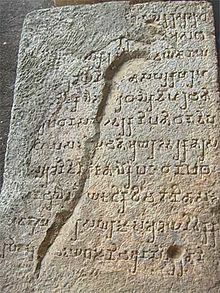 Anuradhapura and the Early Use of the Brahmi Script". Cambridge Archaeological Journal. 6 (1): 73–97. doi:10.1017/S0959774300001608. ISSN 1474-0540. ^ a b Brahmi, Encyclopedia Britannica (1999), Quote: "Brāhmī, writing system ancestral to all Indian scripts except Kharoṣṭhī. Of Aramaic derivation or inspiration, it can be traced to the 8th or 7th century BC, when it may have been introduced to Indian merchants by people of Semitic origin. (...) a coin of the 4th century BC, discovered in Madhya Pradesh, is inscribed with Brāhmī characters running from right to left." ^ a b Salomon 1998, pp. 19–30. ^ Brahmi, Encyclopedia Britannica (1999), Quote: "Among the many descendants of Brāhmī are Devanāgarī (used for Sanskrit, Hindi, and other Indian languages), the Bengali and Gujarati scripts, and those of the Dravidian languages"
^ a b c d e f Ray, Himanshu Prabha (2017). Buddhism and Gandhara: An Archaeology of Museum Collections. Taylor & Francis. p. 181. ISBN 9781351252744. ^ a b Asiatic Society of Bengal (1837). Journal of the Asiatic Society of Bengal. Oxford University. ^ a b More details about Buddhist monuments at Sanchi Archived 2011-07-21 at the Wayback Machine, Archaeological Survey of India, 1989. ^ Salomon 1998, p. 20. ^ a b Scharfe, Hartmut (2002). "Kharosti and Brahmi". Journal of the American Oriental Society. 122 (2): 391–393. doi:10.2307/3087634. ^ Keay 2000, p. 129–131. ^ Falk 1993, p. 106. ^ Trautmann 2006, p. 64. ^ Salomon 1998, pp. 56–63. ^ a b Georg Bühler (1898). 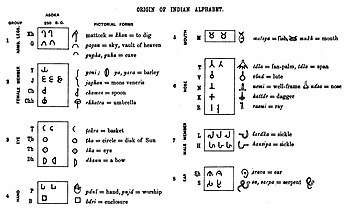 On the Origin of the Indian Brahma Alphabet. K.J. Trübner. pp. 6, 14–15, 23, 29. , Quote: "(...) a passage of the Lalitavistara which describes the first visit of Prince Siddhartha, the future Buddha, to the writing school..." (page 6); "In the account of Prince Siddhartha's first visit to the writing school, extracted by Professor Terrien de la Couperie from the Chinese translation of the Lalitavistara of 308 AD, there occurs besides the mention of the sixty-four alphabets, known also from the printed Sanskrit text, the utterance of the Master Visvamitra[.]" ^ Nado, Lopon (1982). "The Development of Language in Bhutan". The Journal of the International Association of Buddhist Studies. 5 (2): 95. Under different teachers, such as the Brahmin Lipikara and Deva Vidyasinha, he mastered Indian philology and scripts. According to Lalitavistara, there were as many as sixty-four scripts in India. ^ Tsung-i, Jao (1964). "CHINESE SOURCES ON BRĀHMĪ AND KHAROṢṬHĪ". Annals of the Bhandarkar Oriental Research Institute. 45 (1/4): 39–47. doi:10.2307/41682442. JSTOR 41682442. ^ a b Salomon 1998, p. 9. ^ a b c Falk 1993, pp. 109–167. ^ a b Salomon 1996, p. 378. ^ a b Bühler 1898, p. 2. ^ S. R. Goyal in: S.P.Gupta, K.S.Ramachandran (eds. ), The Origin of Brahmi Script (1979), cited after Salomon (1998). ^ Salomon (1998), p. 19, fn. 42: "there is no doubt some truth in Goyal's comment that some of their views have been affected by 'nationalist bias' and 'imperialist bias,' respectively." ^ Cunningham, Alexander (1877). Corpus Inscriptionum Indicarum v. 1: Inscriptions of Asoka. Calcutta: Superintendent of Government Printing. p. 54. ^ a b Salomon 1998, pp. 18-24. ^ Salomon 1998, p. 19-21 with footnotes. ^ Annette Wilke & Oliver Moebus 2011, p. 194 with footnote 421. ^ F. R. Allchin; George Erdosy (1995). The Archaeology of Early Historic South Asia: The Emergence of Cities and States. Cambridge University Press. pp. 309–310. ISBN 978-0-521-37695-2. ^ Justeson, J.S. ; Stephens, L.D. (1993). "The evolution of syllabaries from alphabets". Die Sprache. 35: 2–46. ^ a b c Salomon 1998, p. 22. ^ a b Bühler 1898, p. 84–91. ^ Salomon 1998, pp. 23–24. ^ a b c Salomon 1998, p. 28. ^ Bühler 1898, p. 59,68,71,75. ^ Bühler 1898, p. 76-77. ^ Bühler 1898, p. 82-83. ^ a b Salomon 1998, p. 25. ^ Hultzsch, E. (1925). Corpus Inscriptionum Indicarum v. 1: Inscriptions of Asoka. Oxford: Clarendon Press. p. xlii. Retrieved 8 April 2015. ^ Tavernier, Jan (2007). "The Case of Elamite Tep-/Tip- and Akkadian Tuppu". Iran. 45: 57–69. Retrieved 8 April 2015. ^ a b "Falk goes too far. It is fair to expect that we believe that Vedic memorisation — though without parallel in any other human society — has been able to preserve very long texts for many centuries without losing a syllable. (...) However, the oral composition of a work as complex as Pāṇini’s grammar is not only without parallel in other human cultures, it is without parallel in India itself. (...) It just will not do to state that our difficulty in conceiving any such thing is our problem." Bronkhorst, Johannes (2002). "Literacy and Rationality in Ancient India". Asiatische Studien / Études Asiatiques. 56 (4): 803–804, 797–831. ^ Annette Wilke & Oliver Moebus 2011, p. 194, footnote 421. ^ a b c Salomon, Richard (1995). "Review: On the Origin of the Early Indian Scripts". Journal of the American Oriental Society. 115 (2): 271–278. doi:10.2307/604670. ^ Salomon 1998, pp. 23. ^ Falk 1993, pp. 104. Iravatham Mahadevan (1970). Tamil-Brahmi Inscriptions. State Department of Archaeology, Government of Tamil Nadu. pp. 1–12. ^ a b Bertold Spuler (1975). Handbook of Oriental Studies. BRILL Academic. p. 44. ISBN 90-04-04190-7. ^ Salomon 1998, pp. 19–24. ^ John Marshall (1931). Mohenjo-daro and the Indus civilization: being an official account of archaeological excavations at Mohenjo-Daro carried out by the government of India between the years 1922 and 1927. Asian Educational Services. p. 423. ISBN 978-81-206-1179-5. , Quote: "Langdon also suggested that the Brahmi script was derived from the Indus writing, (...)". ^ Senarat Paranavitana; Leelananda Prematilleka; Johanna Engelberta van Lohuizen-De Leeuw (1978). Studies in South Asian Culture: Senarat Paranavitana Commemoration Volume. BRILL Academic. p. 119. ISBN 90-04-05455-3. ^ Georg Feuerstein; Subhash Kak; David Frawley (2005). The Search of the Cradle of Civilization: New Light on Ancient India. Motilal Banarsidass. pp. 136–137. ISBN 978-81-208-2037-1. ^ Jack Goody (1987). The Interface Between the Written and the Oral. Cambridge University Press. pp. 301 footnote 4. ISBN 978-0-521-33794-6. , Quote: "In recent years, I have been leaning towards the view that the Brahmi script had an independent Indian evolution, probably emerging from the breakdown of the old Harappan script in the first half of the second millennium BC". ^ Senarat Paranavitana; Leelananda Prematilleka; Johanna Engelberta van Lohuizen-De Leeuw (1978). Studies in South Asian Culture: Senarat Paranavitana Commemoration Volume. BRILL Academic. pp. 119–120 with footnotes. ISBN 90-04-05455-3. ^ Salomon 1998, pp. 20–21. ^ a b Khan, Omar. "Mahadevan Interview: Full Text". Harappa. Retrieved 4 June 2015. ^ Fábri, C. L. (1935). "The Punch-Marked Coins: A Survival of the Indus Civilization". The Journal of the Royal Asiatic Society of Great Britain and Ireland (2): 307–318. doi:10.2307/25201111. JSTOR 25201111. ^ Salomon 1998, p. 21. ^ Masica 1993, p. 135. ^ Hultzsch, E. (1925). Corpus Inscriptionum Indicarum v. 1: Inscriptions of Asoka. Oxford: Clarendon Press. p. xlii. ^ Sharma, R. S. (2006). India's Ancient Past. Oxford University Press. p. 163. ISBN 9780199087860. ^ "The word dipi appears in the Old Persian inscription of Darius I at Behistan (Column IV. 39) having the meaning inscription or "written document" in Congress, Indian History (2007). Proceedings - Indian History Congress. p. 90. ^ Strabo (1903). Hamilton, H.C.; Falconer, W., eds. The Geography of Strabo. Literally translated, with notes, in three volumes. London: George Bell and Sons. p. 15.1.53. ^ Timmer 1930, p. 245. ^ Strabo (1903). Hamilton, H.C.; Falconer, W., eds. The Geography of Strabo. Literally translated, with notes, in three volumes. London: George Bell and Sons. p. 15.1.39. ^ Sterling, Gregory E. (1992). Historiography and Self-Definition: Josephos, Luke-Acts, and Apologetic Historiography. Brill. p. 95. ^ McCrindle, J.W. (1877). Ancient India As Described By Megasthenes And Arrian. London: Trübner and Co. pp. 40, 209. Retrieved 14 April 2015. ^ Salomon 1998, p. 11. ^ Kenneth Roy Norman (2005). Buddhist Forum Volume V: Philological Approach to Buddhism. Routledge. pp. 67, 56–57, 65–73. ISBN 978-1-135-75154-8. ^ Jack Goody (2010). Myth, Ritual and the Oral. Cambridge University Press. pp. 42–47, 65–81. ISBN 978-1-139-49303-1. ^ Annette Wilke & Oliver Moebus 2011, pp. 182–183. ^ Walter J. Ong; John Hartley (2012). Orality and Literacy: The Technologizing of the Word. Routledge. pp. 64–69. ISBN 978-0-415-53837-4. ^ Monier Monier-Williams (1970). Sanskrit-English dictionary. Motilal Banarsidass (Reprint of Oxford Claredon). p. xxvi with footnotes. ISBN 978-5-458-25035-1. ^ Arthur Anthony Macdonell (2004). Sanskrit English Dictionary (Practical Hand Book). Asian Educational Services. p. 200. ISBN 978-81-206-1779-7. ^ a b Salomon 1998, pp. 72-81. ^ Salomon 1998, pp. 86-87. ^ Salomon 1998, p. 82. ^ Salomon 1998, pp. 81-84. ^ a b Salomon 1996, p. 377. ^ Salomon 1998, pp. 122-123, 129-131, 262-307. ^ a b Salomon 1998, pp. 12–13. ^ a b c Coningham, R.A.E. ; Allchin, F.R. ; Batt, C.M. ; Lucy, D. (22 December 2008). "Passage to India? Anuradhapura and the Early Use of the Brahmi Script". Cambridge Archaeological Journal. 6 (01): 73. doi:10.1017/S0959774300001608. ^ Falk, H. (2014). "Owner's graffiti on pottery from Tissamaharama", in Zeitchriftfür Archäeologie Aussereuropäischer Kulturen. 6. pp.45-47. ^ Rajan prefers the term "Prakrit-Brahmi" to distinguish Prakrit-language Brahmi inscriptions. ^ Rajan, K.; Yatheeskumar, V.P. (2013). "New evidences on scientific dates for Brāhmī Script as revealed from Porunthal and Kodumanal Excavations" (PDF). Prāgdhārā. 21-22: 280–295. Archived from the original (PDF) on 13 October 2015. Retrieved 12 January 2016. ^ Journal of the Asiatic Society of Bengal. Calcutta : Printed at the Baptist Mission Press [etc.] 1838. ^ Salomon 1998, pp. 204–206. ^ Journal of the Asiatic Society of Bengal. Calcutta : Printed at the Baptist Mission Press [etc.] 1834. pp. 495–499. ^ Salomon, Richard (1998). Indian Epigraphy: A Guide to the Study of Inscriptions in Sanskrit, Prakrit, and the other Indo-Aryan Languages. Oxford University Press. p. 206. ISBN 9780195356663. ^ Salomon 1998, p. 207. ^ Journal of the Asiatic Society of Bengal. Calcutta : Printed at the Baptist Mission Press [etc.] 1838. pp. 219–285. ^ Salomon 1998, p. 208. ^ Raghupathy, Ponnambalam (1987). Early settlements in Jaffna, an archaeological survey. Madras: Raghupathy. ^ P Shanmugam (2009). Hermann Kulke; et al., eds. Nagapattinam to Suvarnadwipa: Reflections on the Chola Naval Expeditions to Southeast Asia. Institute of Southeast Asian Studies. p. 208. ISBN 978-981-230-937-2. ^ a b c Frederick Asher (2018). Matthew Adam Cobb, ed. The Indian Ocean Trade in Antiquity: Political, Cultural and Economic Impacts. Taylor & Francis Group. p. 158. ISBN 978-1-138-73826-3. ^ Salomon 1998, pp. 27–28. ^ Salomon 1996, pp. 373–4. ^ Bühler 1898, p. 32. ^ Bühler 1898, p. 33. ^ Trautmann 2006, p. 62–64. ^ Stefan Baums (2006). "Towards a computer encoding for Brahmi". In Gail, A.J. ; Mevissen, G.J.R. ; Saloman, R. Script and Image: Papers on Art and Epigraphy. New Delhi: Shri Jainendra Press. pp. 111–143. ^ Ledyard 1994, p. 336–349. ^ Daniels, Peter T. (Spring 2000). "On Writing Syllables: Three Episodes of Script Transfer" (PDF). Studies in the Linguistic Sciences. 30 (1): 73–86. ^ Script and Font Support in Windows - Windows 10, MSDN Go Global Developer Center. ^ Burjor Avari (2016). India: The Ancient Past: A History of the Indian Subcontinent from C. 7000 BCE to CE 1200. Routledge. pp. 165–167. ISBN 978-1-317-23673-3. ^ Romila Thapar (2004). Early India: From the Origins to AD 1300. University of California Press. pp. 216–217. ISBN 978-0-520-24225-8. ^ Rapson, E. J. (1914). Ancient India. p. 157. This page was last edited on 14 April 2019, at 19:06 (UTC).